By authorization of the king Edouard III of England, Martin d' Urtubie undertakes in 1341 the construction of a castle which partly will be shaved by his wife then rebuilt in first half of XVIe century. He will undergo a last transformation in 1745. Of XIVe century remain the strengthened keep, the wall with its covered way and the flanked pottery of two turns. To the XVIe century were built the main building Renaissance and the tower sheltering a stone staircase with screw. 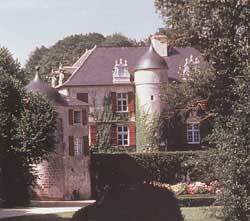 Still increased at the XVIIIe century, the castle saw its altered interior decoration. It comprises a collection of tapestries of Brussels of XVIe century. To make Absolutely: To sleep in one of the rooms of the castle. You will be very received there. The texts and the photographs are extracted from the booklet "Castle of Urtubie".